In today's fast moving life, health and fitness tends to take a backseat. We have a way to keep you fit no matter how short your break is! In today’s world, health and fitness has become top priority for almost everybody. That being said, those who want to take care of their bodies find it hard to do so when they lead such busy lives. So, we recommend bringing yoga into your life because there are hassle free ways to do it even at work! 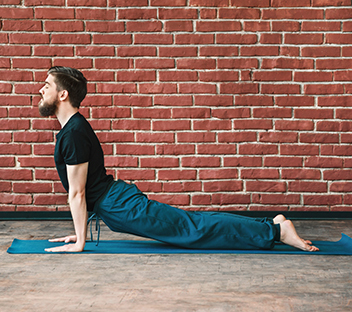 Don’t worry about adding one more thing to your already jam packed day, because we are here to tell you how you can include yoga into your busy schedule. Did you know that you could even influence others’ respiratory rate by slowing down yours? For example, yoga doesn’t only mean holding a pose on your yoga mat; it includes deep breathing and meditation to attain mindfulness. One of the more popular yoga methods - Surya Namaskars - can be done anywhere. As most of you may know, it’s a series of movements and poses that get you to sync your mind, body, and breathing. 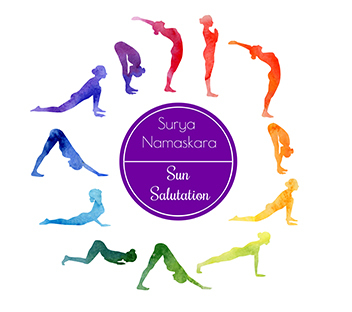 Cycles of Surya Namaskar energise and warm your body, and of course, help with giving you a great full body workout. You’ll be stretching, flexing, and toning, which is perfect if you want to lose weight. Find a corner in your office, do it in your living room – either way, surya namaskars can be done during your busy day. Sometimes sitting on your desk chair while crossing your legs can create an imbalance in your spine and hips. 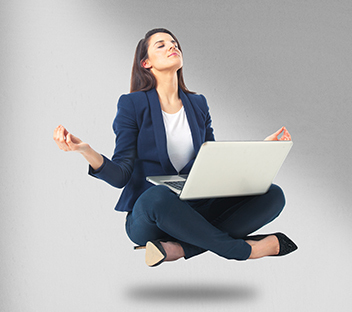 At work itself, you could bring the balance back with the Chair Pigeon Pose. While sitting, keep your feet flat on the floor and cross your right leg over the left leg at a 90-degree angle. Distribute your weight equally while sitting upright. You should be able to feel a stretch on your outer right thigh. Hold this pose for 5 to 10 breaths and then switch sides. 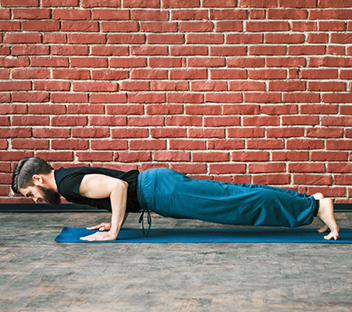 Who knew you could do yoga pushups from the comfort of your office? This movement will ensure the muscles around your neck relax while energising your arms. After all, your neck and arms get stiff and soft throughout your busy day. Stand up and rest your hands (shoulder width distance) on the edge of your desk. Take a step back to ensure your torso is in a diagonal line with the floor. Inhale as you bend your elbows (as you would in a regular pushup) in a 90-degree angle. Exhale and lift your chest back up into the starting position. Those of you who spend too much time in front of a computer screen probably don’t have the best posture. For better posture and strengthening your back, using your desk, get into the Upward Dog Pose. Keep your hands on the edge of the desk and lower your hips towards it. Ensure your arms are straight and that you don’t bend your lower back too much. Lift your chin upwards, stretch your chest, and straighten those shoulders. Hold this pose for 5 to 10 breaths. If you prefer having somebody to guide you, why not check out some online yoga classes? You’ll be able to pick how long you want the session to last – it’s all up to you! Alternatively, you could also go for a yoga class either right before work or right after. Try and find a class close to work or home and carry another set of clothes, depending on when you go. As you know, if there is a will, there is a way. Now that you know it’s possible to include yoga into your busy schedule, no more excuses! It’ll be a much-needed break from your stressful day.